Using a smartphone while driving is illegal almost everywhere, but with the smartwatch now up-and-coming, there surely must be a debate on whether these wrist computers are just as much of a distraction. One Canadian driver, who has accrued four points on his license and been hit with a fine of $120 for using his Apple Watch while driving, believes that the law is not clear enough, and when you look at the wording of his supposed violation, it’s hard to disagree with his assessment. It’s an interesting scenario, particularly since, if we’re splitting hairs, the Apple Watch is not a handheld. Sure, it can make calls and receive them via an iPhone, but it doesn’t seem that the Watch, or indeed any other such wearable, is properly covered by this line in the Quebec Highway Safety code. It’s not so much handheld. It’s a watch. You know, it’s on my wrist. That’s where it gets controversial. It’s like, ‘Is it? Is it not?’ but I think this needs to be talked about. It’s [Apple Watch] rather a Bluetooth device that communicates a telephone signal from the phone and it has been established in the law that you’re allowed to use Bluetooth devices and it doesn’t constitute an infraction. There’s no question that using an Apple Watch to flit through songs can be seen as a distraction, and could impair the focus of a driver enough to cause a crash. However, the same can be said of in-car infotainment devices and, as the lawyer points out, other general Bluetooth devices. The law in Quebec, as well as elsewhere, will need to be a bit more black-and-white on its standing with smartwatches, but if you do opt to drive while using your wrist gadget, don’t be surprised if you are also pulled over and put to rights. 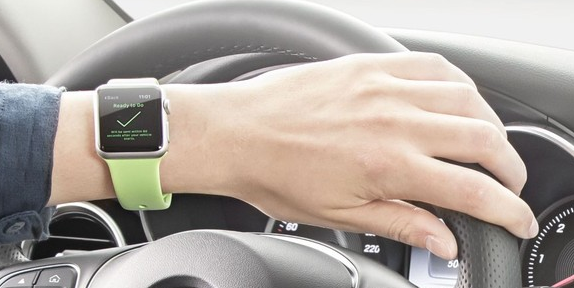 Do you believe a wearable like the Apple Watch should be tarred with the same brush as a smartphone when being used behind the wheel?